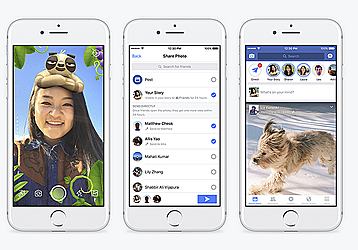 NEW YORK (AP) — Facebook is adding more Snapchat-like features to its app. The company says it wants to let your camera "do the talking" as more people are posting photos and videos instead of blocks of text. Also new is a "stories" tool that lets you post photos and videos that stay live for 24 hours. This feature is already available on Messenger and Instagram, which is owned by Facebook. It might be working: Snapchat's growth rate has slowed down since Instagram introduced its own "stories" feature.